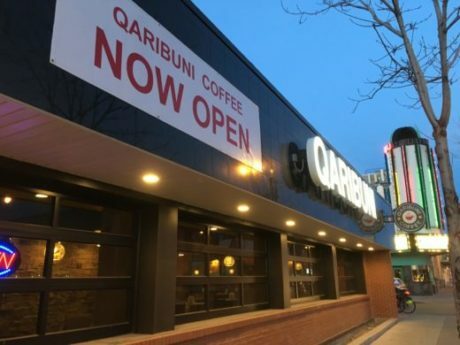 QARIBUNI COFFEE has opened! Daily 7 a.m. to 9 p.m. across 15th Ave. from Avalon/HOBT. Windows in photo open fully-warm days, a fireplace for cooler and a hallway connects to the QURUXLOW Restaurant completing a 14th-15th Ave. evolution from previous stores, Peterson-Chrysler/Plymouth, Kawasaki Motorcycle, a gas station, and Kaplan Bros. Clothing, including a dust-free concrete parking lot.